Tempeh: Looks weird. Has a weird name. It’s fermented… Weird. I’ve never been very attracted to the idea of eating it, but as a replacement for meat it takes the cake. A serving of tempeh provides you with 16 grams of protein and since the soybeans that make up the cake have been cultured, it is very easy to digest. I have to remember to never read a book by it’s cover, because this stuff is delicious. 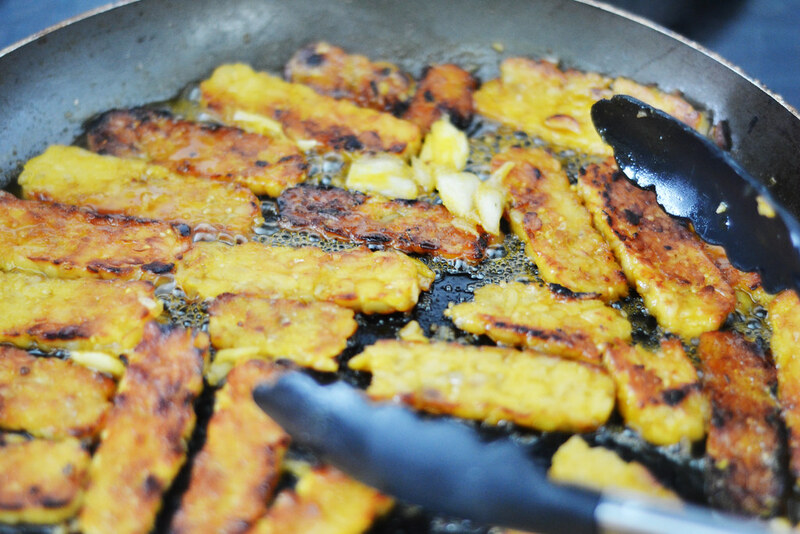 The process of cooking tempeh is very easy: Slice into 1/4 inch strips and fry until golden on either side with your oil of choice. I used olive oil and cooked it on medium high heat for about 5 minutes on each side. The result is a crunchy outside crust on the tempeh that ready for a sauced to de drizzled on top. This recipe turned out amazing and I am no longer unsure about tempeh. It is similar to tofu in how it can adapt in flavor according to how you dress it, making it very versatile and easy to add to a variety of meals. Put the orange juice in a small bowl. Squeeze the grated ginger over the bowl to extract the juices, then discard the pulp. Add the tamari, mirin, and maple syrup, ground coriander, and garlic. Mix together and set aside. Cut the tempeh (or tofu) into thin-ish, bite-sized pieces, and if working with tofu, pat dry with a paper towel. Put the olive oil in a large frying pan over medium-high heat. When the oil is hot but not smoking, add the tempeh and fry for 5 minutes, or until golden underneath. Turn and cook the other side for another 5 minutes, or until golden. Pour the orange juice mixture into the pan and simmer for 10 minutes, or until the sauce has reduced to a lovely thick glaze. Turn the tempeh once more during this time and spoon the sauce over the tofu from time to time. Serve the tempeh drizzled with any remaining sauce and a squeeze of lime, with the coriander scattered on top.